Topical games are becoming more and more relevant in this day and age. Sometimes this type of game is very obscure and abstract, while at other times the game blatantly tells you what the hell is going on, and why we should feel bad. 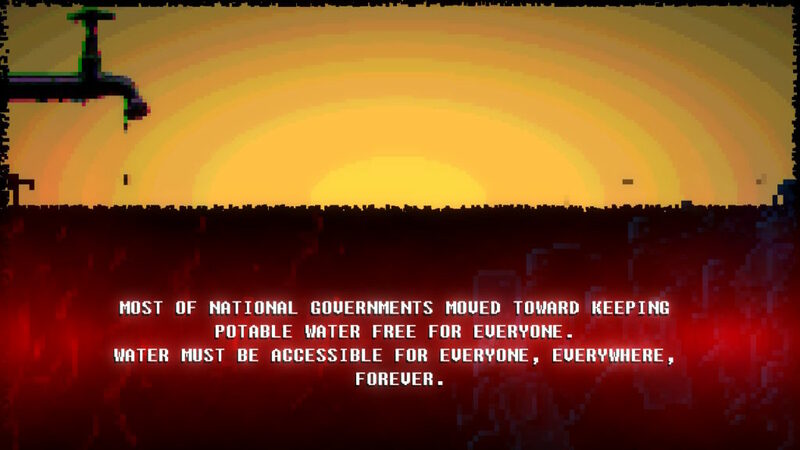 This time RIOT: Civil Unrest presents us with a lot of real life situations where riots truly made a difference. In this game you can play on the side that wants change and has to fight for it, or you can play on the side of the law enforcement troops that sometimes hide behind their weapons and their so-called orders of the day. With some Molotov cocktails underneath our sofa and strapped into our riot gear, we wanted to determine how much of a riot this game could be. There is no actual story that is being told in the game, but there are in fact many real life events being portrayed, such as the Arab Spring. 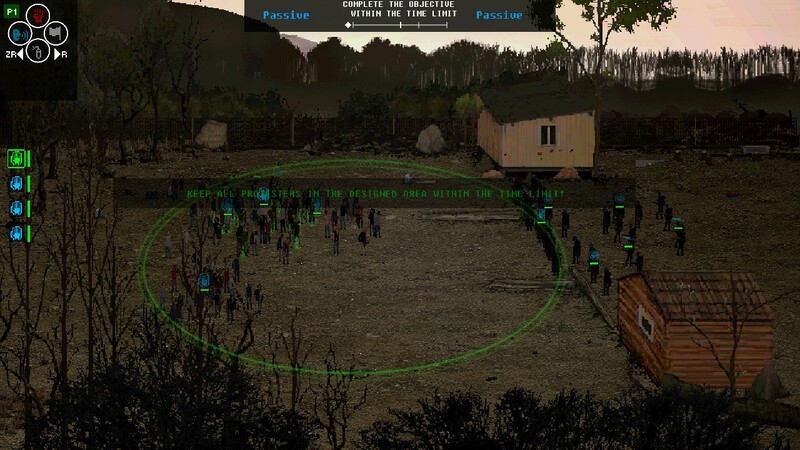 While the gameplay itself will not be true to the actual events, as you have a lot of options to turn some peaceful events violent and so on, it’s often the background of the event that is interesting. You’ll often get a bit of information about the event and that’s about it. You can choose to ignore whatever happened and just get to the gameplay. Even though the graphical style for the game uses a heavy pixilated look, the game does feel very realistic. At all times, you’ll see a lot of movement onscreen, from both the protesters as well as the riot police trying to keep things in tow. The game has interesting backdrops and the colors used are also very realistic. Even though the game lacks details, seeing the characters don’t have faces or any distinct features safe for a few different colors, there’s something about how this game comes to life both on your TV as well as when playing in the handheld mode. The game’s forte is probably the fact that everything is heavily zoomed out, giving you a proper view on what is going on. 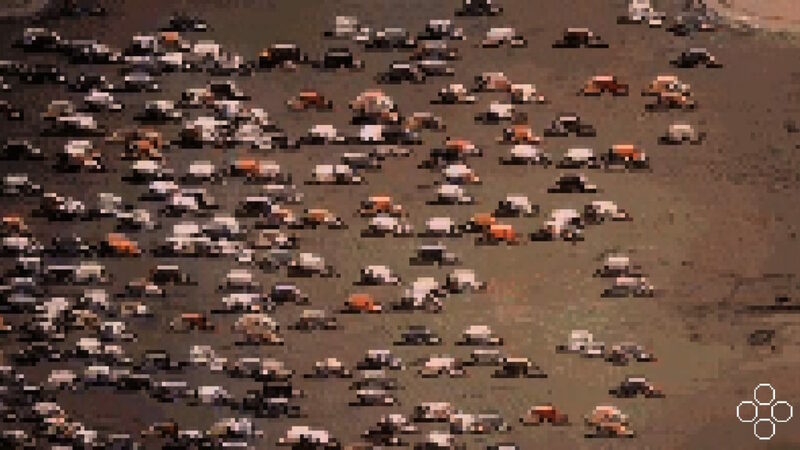 The many individuals acting as a group, but still showing a lot of individual movements is probably also what makes this game realistic. While there are some tunes present in some menus or in-between stages, the game is otherwise completely void of music. During the levels you’ll have to make do with the chants, screams and grunts of the protestors, and the weapons used by the riot police. Other than that, there is no real voice acting or nothing noteworthy present in the sound design department, which is absolutely fine. 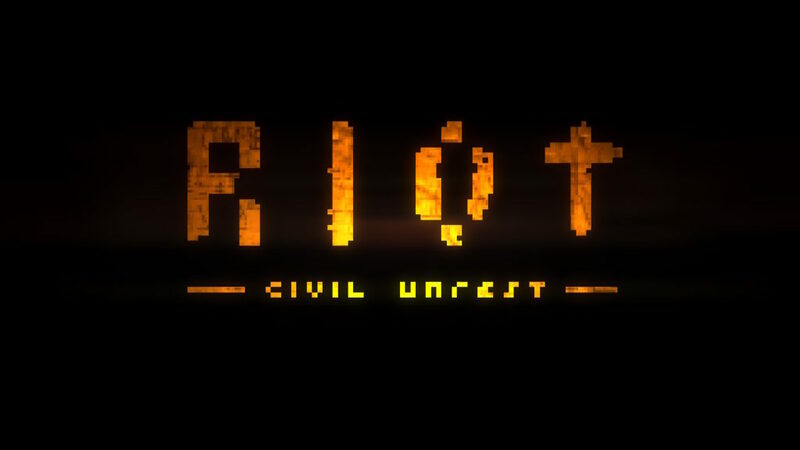 RIOT: Civil Unrest is a mix of simulation and strategy, as you’ll either have to riot and stand up for your beliefs, or press back rioters to restore law and order. The game will put you in the shoes of either side of the fence, depending on your choice after picking the mode you wish to play. Sadly, the game doesn’t come with a lot of instructions or help, and you’re just mucking about for a long time before you properly know what is what, and how the controls actually work. As stated above, you can either choose to be a rioter or a police officer, both parties will have different small clusters of people you can command. 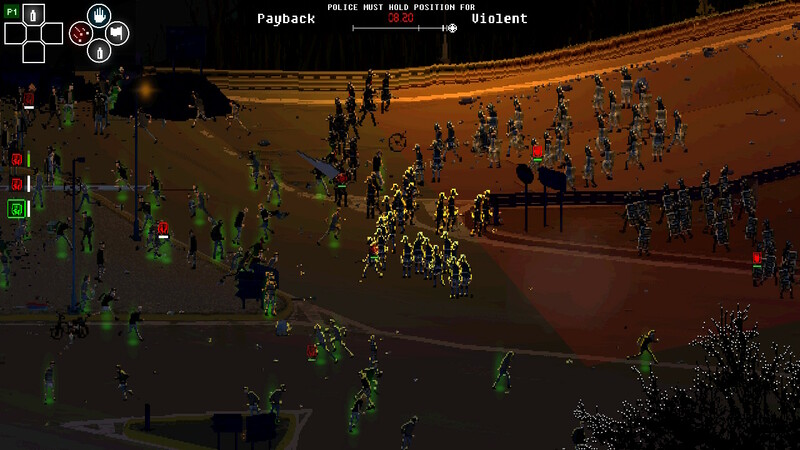 The rioters often have limited resources, but they can eventually throw some items to make it harder for the police officers on scene, but when starting to act violent, you can expect the police to retaliate. The other side is pretty much the same. Before you start to disperse a crowd, you can choose what tactical units you deploy and what gear they come with. The latter can be important for bigger protests and to scare off rioters, but when you turn too violent in oppressing the common protester, you will still fail the mission. You can opt to shoot people that come too close, but this will make you lose score points, and if you lose too much, you’ll lose the mission and have to try again. The game has a few different modes, namely the Global, Story and Versus modes. The Global mode is pretty much a long chain of playable scenarios which happen all around the globe. Each time you complete a mission, you’ll unlock the next. The Story mode will present you with a few different scenarios that had more protests than one, such as the Arab Spring which went on for a pretty long time. Last but not least there’s the Versus mode in which you can simply decide who is the best rioter and who perhaps has a career in law enforcement. Just like a real protest, things do feel a bit random at times. Sometimes it feels like you’re in control, only to see everyone scurrying away in every direction. The controls of the game feel lacking for console purposes and the fact that there’s no proper explanation on what is what, makes the game a lot more tedious than it could have been. Somewhere it feels like the game isn’t properly finished or ported for a console release. The game comes with a lot of content and different difficulties making sure there’s more than enough to do before clearing everything. Also the fact that you can replay each level from the other side of the fence makes the game interesting. RIOT: Civil Unrest is a cool concept and a fairly decent game. While the game feels a bit slow and random at times, the overall execution is spot on. This game could have been even better if there were proper tutorials and somewhat more intuitive controls for console play. Nonetheless, if you’re looking for a very original title for your Switch collection, you’ll be happy to hear that this game is also getting a physical release.